On May 23, 1926, Western Air Express inaugurated the “first scheduled airline passenger service” in the United States, flying the nation’s first commercial airline passenger from Salt Lake City to Los Angeles. Although a few early airboat ventures provided regularly scheduled service along coastal locations prior to 1926, this first flight by Western Air Express would give birth to the first year-round airline transportation service using landplanes and land-based runways. This “fixed route” overland passenger service marked the beginning of passenger airtravel in the U.S. as we know it today. It would also serve as the inception of what would go on to be referred to as the “first profitable airline in the world” and the only successful survivor of the nation’s early commercial air transportation ventures. Upon arrival of this first commercial flight, there was a ceremony that included presentation of the certificate below, which is now part the BirthofAviation.org collection. 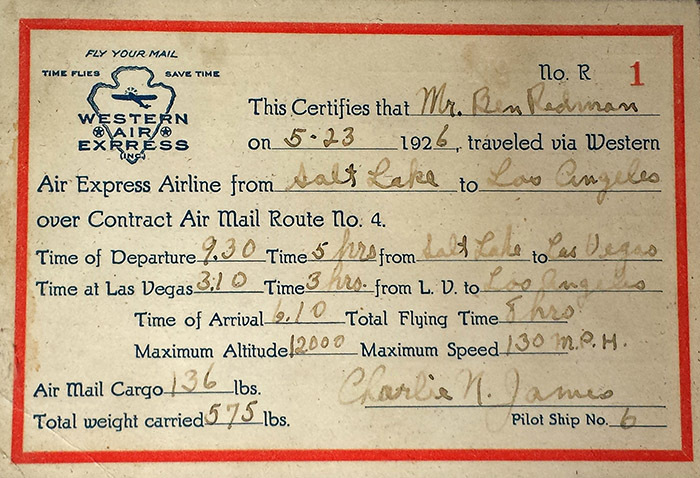 Signed by Western Air Express pilot Jimmy James, it confirms Mr. Ben F. Redman of Salt Lake City, Utah as the first official passenger. Today, through the Delta family tree of airlines, the ticket issued to Mr. Redman remains the oldest passenger airline ticket of surviving legacy in the U.S. Certificate presented in a ceremony after Western Air Express’s inauguration of passenger service on May 23, 1926, which represented the first “regularly scheduled passenger flight” in the United States. Part of the BirthofAviation.org Collection. “Ben F. Redman’s unusual hobby was being first – and he wanted very much to be the nation’s first airline passenger. As a stockholder of Western Air Express he had attained a priority status, so he wrote to the air mail contracts division chief and expressed his desire, enclosing a $20 check as a deposit – thereby making the world’s first airline reservation.